From the Cumberland Gap to the Atlantic Ocean, this is Virginia Water Radio for the week of March 30, 2015. This week, we feature a mystery sound mix. Have a listen for about 15 seconds, and see if you can guess what water-related bird disease is the focus of research related to these sounds. And here’s a hint: certain kinds of buzzing can mean a “bad air” day. If you guessed avian malaria, you’re right! You heard Red-winged Blackbirds, a mosquito’s buzz, and the buzz of an electric-power station. 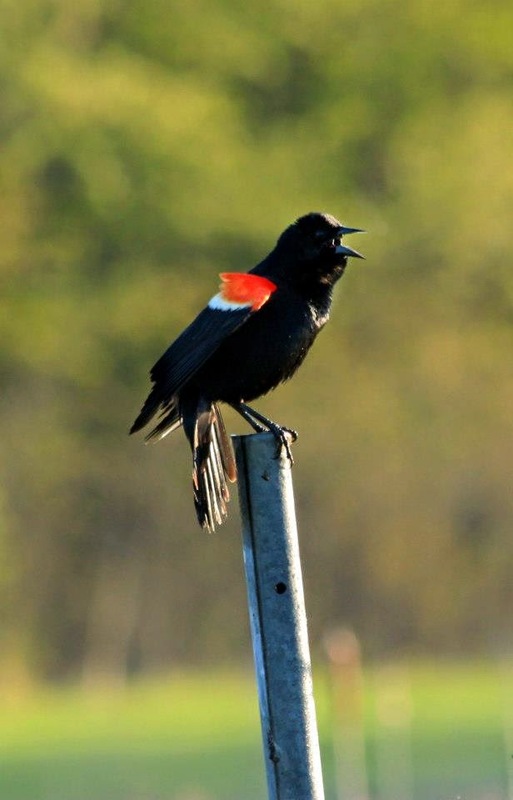 All relate to aspects of research by Virginia Tech Biological Sciences graduate student Laura Schoenle on avian malaria in Red-winged Blackbirds, an abundant species often seen near water in Virginia and all of North America. Ms. Schoenle’s work tackles some of the challenging complexity of connections among living organisms, their environments, and human activities, including human energy use. Let’s consider some of those connections. Malaria, named after an Italian phrase for “bad air,” is caused by single-celled parasites transmitted by blood-feeding mosquitoes. Several parasite species can cause avian malaria, but these species are different from several others that cause human malaria. Ms. Schoenle’s research focuses on how Red-wings’ physiology responds to the stress of a malaria infection, particularly the birds’ immune response and the levels of glucocorticoids, which are hormones in humans, birds, and other animals that regulate stress responses. Ms. Schoenle is also investigating whether that stress response may be affected by mercury in the birds’ food, which in summer is largely aquatic insects and other organisms in aquatic food webs. Nationwide, air emissions from coal- and oil-fired electric power plants are a significant source of atmospheric mercury, which can travel hundreds of miles, eventually be deposited into water bodies, and potentially enter aquatic food webs. Parasites, mosquitoes, birds, aquatic insects, human energy use, air, water, mercury: If this weren’t already complicated enough, stress-response hormones in birds—as well as in you and me—affect not only immune systems but many interconnected organs and functions, such as the brain, circulation, and blood-sugar levels. So we close this connections conversation with part of “Isles of Langerhans,” a tune by the Blacksburg- and Roanoke-based group No Strings Attached, and named for the part of the pancreas that produces insulin and other blood-sugar-regulating chemicals—one more place where complicated biological and environmental connections happen. Thanks to No Strings Attached for permission to use their music, and thanks to Freesound.org for the mosquito sound. Red-winged Blackbird male. Photo courtesy of Laura Schoenle. 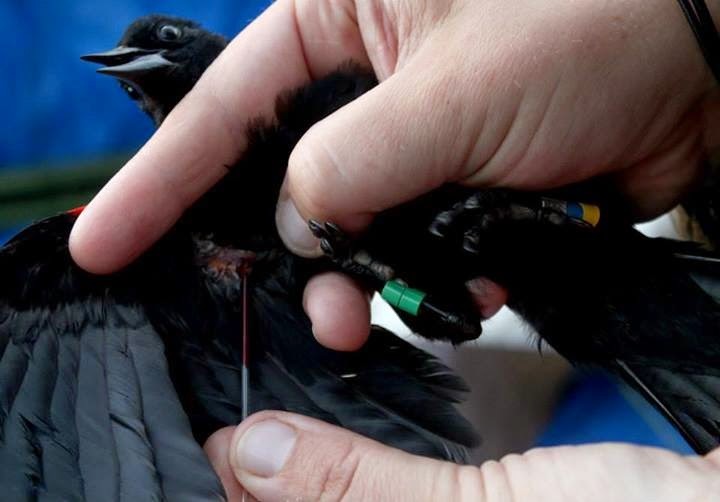 Blood being sampled from a Red-winged Blackbird in spring 2013, as part of avian malaria research by Virginia Tech graduate student Laura Schoenle. Photo courtesy of Laura Schoenle. 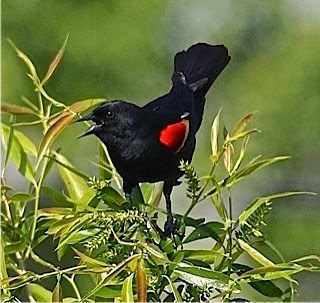 Red-winged Blackbird near the New River in Radford, Va., May 2015. Photo courtesy of Robert Abraham. Thanks to Laura Schoenle for her help with this episode. More information about her research is available in “Environmental Protection Agency recognizes doctoral student's research on birds,” by Lindsay Taylor Key, Virginia Tech News, 11/4/14, available online at http://www.vtnews.vt.edu/articles/2014/11/110414-fralin-epafellowship.html. The mosquito sound was recorded by user Zywx and made available for public use on Freesound.org, online at https://www.freesound.org/people/Zywx/sounds/188708/, under Creative Commons License 0 (public domain). For more information on Creative Commons licenses, please see http://creativecommons.org/. The excerpt of “Isles of Langerhans,” by No Strings Attached, was from the 2002 album, “In the Vinyl Tradition Vol. I,” from Enessay Music, used with permission. More information about No Strings Attached is available online at http://www.enessay.com. “All About Birds,” Cornell University Lab of Ornithology, online at http://www.allaboutbirds.org; and “Birds of North America Online” Cornell University Lab of Ornithology and American Ornithologists’ Union, online at http://bna.birds.cornell.edu/bna (subscription required).Endocrine Physiology, by Balint Kacsoh, McGraw-Hill, New York, 2000. “The endocrine pancreas of birds,” G. Sitbon and P. Miahle, J. Physiology, 1980: 76(1); pp. 5-24; abstract online at Web site of National Institutes of Health/U.S. National Library of Medicine, at http://www.ncbi.nlm.nih.gov/pubmed/6106057. “The Hormones: Corticoid,” Tulane University “e.hormone” Web site, at http://e.hormone.tulane.edu/learning/corticoids.html. National Wildlife Health Center, Field Manual of Wildlife Disease — General Field Procedures and Diseases of Birds, Chapter 24: Hemosporidiosis (Avian Malaria), online at http://www.nwhc.usgs.gov/publications/field_manual/. U.S. Centers for Disease Control and Prevention, “About Malaria,” online at http://www.cdc.gov/malaria/about/index.html. U.S. Environmental Protection Agency, “Mercury,” online at http://www.epa.gov/mercury/index.html. U.S. Geological Survey, “Fact Sheets on Mercury in the Environment,” online at http://www.usgs.gov/mercury/publications.asp. Virginia Department of Game and Inland Fisheries, “Species Information” Web page, online at http://vafwis.org/fwis/?Menu=Home.Species+Information. Virginia Society of Ornithology, a non-profit organization dedicated to the study, conservation, and enjoyment of birds in the Commonwealth; Web site: www.virginiabirds.net. Voshell, J. Reese, Jr. Guide to Common Freshwater Invertebrates of North America, McDonald & Woodward Publishing, Blacksburg, Va., 2002. “Mosquitoes and Water,” Virginia Water Central, June 2009, pp. 6-15 (Virginia Water Resources Research Center, Blacksburg, Va.), online at http://vwrrc.vt.edu/pdfs/newsletter/049Jun2009.pdf. Virginia Tech Department of Entomology Insect Identification Lab, online at http://www.insectid.ento.vt.edu/. For a subject list of all previous episodes, please see the Index link above (http://www.virginiawaterradio.org/p/index.html).